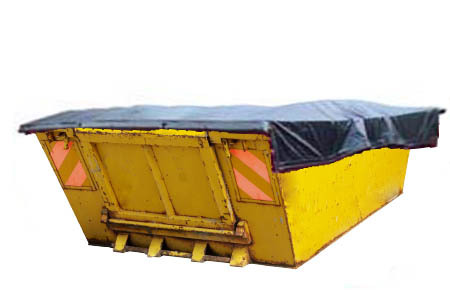 Skip covers provide protection against overspill and dust contamination for waste skips. They also provide an element of security and confidentiality and deter pests. Skip covers will also prevent the waste skip load from rain and other inclement weather. Our skip covers are made from heavy duty pvc. They are robust and easy to fit with brass eyelets on all 4 edges so that the cover can be anchored. Waste skip sizes and capacity are usually described in “yards”. We have therefore grouped our skip cover sizes the same way. However, skip sizes are not standardized and therefore even if 2 skips have the same yard number, this does not mean they will be exactly the same shape (though they should have a similar holding capacity). Because of this variation, we have surveyed the market and produced skip covers that will cope with the largest of the sizes within a given yard number. As such, our skip cover yard number should match the yard number of the skip you are covering and amply fit over it. For example, our 10 yard skip covers should fit a 10 yard skip. Please note that all products on this web site can be purchased or leased from us. © Copyright 2012, 5ES All Rights Reserved.